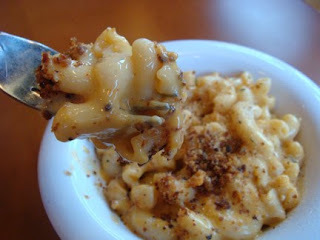 We Heart Mac and Cheese: Veggie Grill: Mac and Cheese sans Cheese. Veggie Grill: Mac and Cheese sans Cheese. My friend Laura is a vegan but I love her anyway. I kid! Anyway, we meet occasionally for dinner and lately we’ve been enjoying Veggie Grill, an emerging chain of casual restaurants featuring a 100% plant-based menu. I am a carnivore, no two ways about it, and I am not usually a fan of Faux Meat. But the stuff at Veggie Grill is okay by me. Recently they’ve rolled out some new menu items that include a vegan-friendly cheese-like product called daiya. Imagine my delight to see Vegan Macaroni and Cheese ($3.50) among the specials! Naturally, I ordered some to go with our “chickin” pesto sandwiches and sweet potato fries with chipotle crema dipping sauce (yum!). When I placed the order I learned the second alarming fact about my dear Laura, which is she does not like mac and cheese. At first I worried about her mental health but I quickly realized it meant I wouldn’t have to share, so I’ll allow it. Reluctantly. Infidel! When the little dish of vegan mac arrived at our table, I regarded it with equal measures of enthusiasm and suspicion. Clearly it wasn’t a mac of the preferred baked variety, but the top of my portion was sprinkled with dark, irregular breadcrumbs which I took as a good omen. I investigated further, carefully processing one sensory input at a time. The first bite was a delightful surprise, because it really did seem like “real” macaroni and cheese. But the more I ate of it, the less the resemblance held. The pasta is rice-based elbows, each slightly ridged along its length to help cradle the sauce. As rice pastas go, this stuff was okay if slightly past al dente. So the vehicle was fine. It was the “cheese” part of the equation that was less and less convincing as the meal progressed. It looked cheesy and it behaved with an acceptable level of cheesiness, in fact the consistency of the sauce reminded me of the smooth Velveeta-based macs I’m not too proud to admit I’ve enjoyed occasionally: a very creamy, unctuous and satisfying mouthfeel. But this vegan “cheese” falls short in the flavor department. My eyes said, “Cheddar” but my tastebuds said, “Um, what is that flavor that is not at all the flavor of cheese?” It tasted a little sweet and not at all zingy like a good mac should be. I wondered if this daiya product might be one of those sauces made from soaked and pulverized cashews, ubiquitous on vegan menus. But no. This vegan cheese looks and melts like real cheese, but it is made from tapioca, inactive yeast, various plant-based gums and stabilizers and a lot of water and oil. I probably liked it better before I read that. But why fight it? The stuff is not bad. 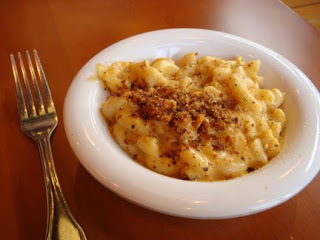 In fact, Veggie Grill’s mac and cheese is probably manna from heaven for actual vegans, who lack my extensive frame of mac and cheese reference and have missed being able to enjoy this most magical comfort food. Me? I’d order it again, but I’d jazz it up with lots of hot sauce. It definitely needs a little something-something. And if I’m going to go all healthy and order steamed kale with a ginger-miso dressing, I think I deserve a little comfort, even if it is faux. I think the pasta is made from quinoa. I just had it the other day and can't wait to go back for more!